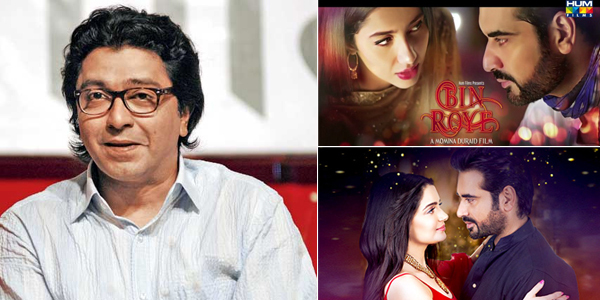 Raj Thackeray-led Maharashtra Navnirman Sena (MNS) has banned the screening of Shah Rukh Khan’s RAEES heroine Mahira Khan’s Pakistani Movie BIN ROYE in Maharashtra reasoning Pakistan backing terrorism in India. According to reports Ameya Khopkar, President of the Maharashtra Navnirman Chitrapat Karmachari Sena, the film wing of the MNS has raised eyebrows about the release of the Pakistani film which was supposed to be released in India along with Salman Khan’s BAJRANGI BHAIJAAN on the auspicious Eid festival. Cleared by Indian censor board for release in India, BIN ROYE is a romantic drama directed by Momina Duraid and is being released in India under the banner of B4U films. While the film will release in other parts of India, it is only Maharashtra state that has banned the movie. Interestingly Salman Khan’s BAJRANGI BHAIJAAN on the other hand will be released in Pakistan this Eid on July 18.